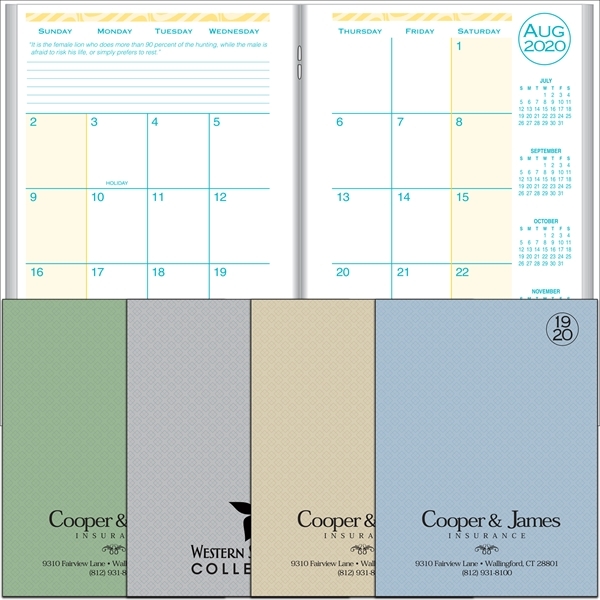 Product Option: Late Order Standard Price (after 7/31) - Let this academic monthly desk planner take some of the sting out of schoolwork this year. This 8 1/16" x 11 7/8" 14-month planner is 48-pages, has a printed weave cover, and is printed in the USA with 15% post-consumer materials. The interior pages are laid out in monthly blocks with plenty of room for notations, and tracking assignments. This planner also features a customizable class schedule, periodic table, weights, measures and metric conversion charts, study and time management tips, and a US map with listed state capitals. Add your school, club, organization or business logo or message to create a great promotional item for students, education conferences, and more. Size: 8 1/16 " x 11 7/8 "